Nie Haisheng, a veteran Chinese astronaut, will be among the three-person crew of China’s fifth manned space mission. The Shenzhou 10 flight is scheduled to launch June 11. Nie previously flew on China’s Shenzhou 6 flight in October 2005. China plans to launch three people on its fifth manned space mission Tuesday (June 11), officials announced over the weekend. China's Shenzhou 10 piloted spacecraft will be launched at 5:38 p.m. Beijing time (5:38 a.m. EDT (0938 GMT)) with a three-person crew from the Jiuquan Satellite Launch Center in the Gobi desert. 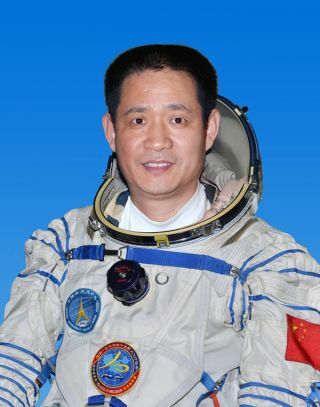 Zhang Xiaoguang is a Chinese pilot selected as part of the Shenzhou program. He was born in Liaoning province and was a squadron commander in the People's Liberation Army Air Force when he was selected to be an astronaut in 1998. Wang Yaping, a former air force pilot, will become China's second female astronaut in space after Liu Yang, who was onboard the Shenzhou 9 mission in 2012. Wang, 35, was selected as an astronaut in 2010 and will work with her colleagues on the orbiting space lab module for 15 days. Zhang Xiaoguang, a Chinese People's Liberation Army Air Force pilot, will be making his first trip to space on the Shenzhou 10 mission. Meanwhile, preparations continue for the Shenzhou 10 spaceship, atop its Long March 2F rocket booster at the Jiuquan Satellite Launch Center in Gansu province. Once in orbit, Shenzhou 10's crew is to rendezvous and dock with the nation's Tiangong 1 space module, which is already circling Earth. The module's orbit has been adjusted in preparation for the forthcoming visit by the Chinese astronauts. During Shenzhou 10's mission of 15 days, there will be two docking tests with the Tiangong 1, one automatic and the other manual, Wu said. The 8.5-ton Tiangong 1, or Heavenly Palace 1, has been circuiting Earth since September 2011 and was used in China's first piloted rendezvous-and-docking venture — the three-person Shenzhou 9 space trek — in June 2012. The Shenzhou 10 mission will be China's fifth piloted space sojourn. The first Chinese astronaut, Yang Liwei, orbited Earth in 2003. Before this upcoming mission, eight Chinese astronauts — including one woman, Liu Yang — have traveled into space. Wang Yaping is due to become China’s second woman astronaut when she launches as part of the three-person crew of Shenzhou 10. "As first space stations go, Tiangong 1 is rather modest … just less than half the mass of the world's first space station, the Soviet Union's Salyut 1. Launched in 1971, it had a mass of about 18.6 metric tons. The first U.S. space station, Skylab, launched in 1973, had a mass of about 77 metric tons," noted Marcia Smith, editor of SpacePolicyOnline.com, in a recent posting. By comparison, Smith said, the International Space Station has a mass of about 400 metric tons and has been permanently occupied by crews of two to six people rotating on four- to six-month missions for the past 13 years. Chinese media outlets report that the Shenzhou 10 mission will be the last of three planned experiments to master the technologies of space rendezvous and docking. The experiences gained will enable China to build and operate a large space station around 2020, officials have said.